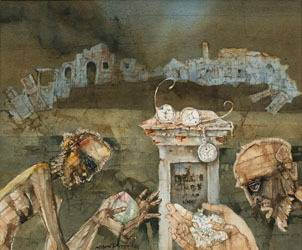 Shyamal Dutta Ray, born in 1935 in Bihar is known for his melancholic and dark water colour works. Ray studied at the Government College of Arts and Crafts in Calcutta. He also founded the Society of Contemporary Artists, an artists' collective,that sought to introduce a new style into the indian art world in the 1960s. Ray works generally had an distorted intensity in his preferred medium of watercolour, at a time when other artists traditionally used lighter and watered down colours. His melancholic and pensive works reflect the contradictions of life around him which represented the hardships and strife in Calcutta at the time of the Bengal Famine.